The presentation will be followed by open-mic playing time for members. Sign up in advance to play — see the Member Events page for details. NYCCGS Member Events are free and open to all members and first-time guests, and are supported by a generous grant from the D’Addario Music Foundation. Hailed as a “revelation to hear” by The Washington Post, the Newman & Oltman Guitar Duo’s phenomenal musicianship places them solidly at the top of their field. Their innovative programming, matchless technique and ensemble precision, combined with their commitment to expanding the repertoire for guitar duo make them a stand-out chamber ensemble in every way. Newman and Oltman’s concert tours have taken them to world cultural capitals and premiere venues across four continents. The Duo has demonstrated extraordinary stylistic breadth in their collaborations with such diverse artists as author Frank McCourt (Angela’s Ashes), composer/conductor Marvin Hamlisch and the Pittsburgh Symphony Pops, mezzo-soprano Frederica von Stade, and fiddler Eileen Ivers. Performances have included collaborations with violinist Timothy Fain at the Raritan River Music Festival, flutist Clare Hoffman and bandoneon virtuoso Daniel Binelli at the Grand Canyon Music Festival, and the New York premiere of Repentance by Sofia Gubaidulina (for three guitars, cello and bass) at the New York Guitar Seminar at Mannes. The Duo also performed concerts and master classes at the Iserlohn International Festival in Germany and at the International Music Festival F. Sor in Bogota, Colombia. Through their groundbreaking New Music Commissioning Program, Newman & Oltman have built a unique repertoire of works for two guitars by composers such as Paul Moravec, Augusta Reed Thomas, Lowell Liebermann, Dušan Bogdanovic and Roberto Sierra. The Duo’s latest CD, Music from Raritan River (MSR Classics 1298), which was hailed by Fanfare magazine as “top notch” and “a winner all around,” features a collection of world premieres commissioned by the duo over the past decade. Their artistry has also been captured on nearly a dozen other acclaimed recordings and has been recognized by grants and awards from the National Endowment for the Arts, Chamber Music America and ASCAP, among others. The Duo has served as ensemble-in-residence at New York’s Mannes College of Music since 1987. 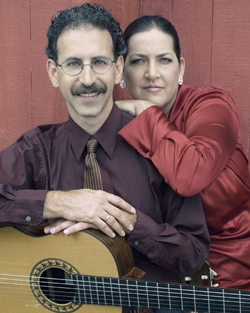 Michael and Laura are founders and artistic directors of the New York Guitar Seminar at Mannes, which takes place every summer in New York City. They also are founders and music directors of New Jersey’s Raritan River Concerts and the Raritan River Music Festival. Michael Newman serves on the faculty of Mannes College. Laura Oltman serves on the faculties of Princeton University and Lafayette College.